Something surely seems missing from this week’s Apple Event. A year ago this month, Apple introduced the svelte, 12-inch MacBook. That makes the little laptop ripe for refresh, but it is MIA. During a media hoopla where the figurative fireworks failed to light, everyone should ask: What is Apple doing? The new 4-inch iPhone is little more than the 5 model introduced in 2012 with fresh internals. The 9.7-inch iPad Pro fits into a crowded category where Apple is mob in the room. Where’s the innovation? After watching the live stream, carefully reviewing what Apple executives said, and looking over device sales trends, I must say this: Either Tim Cook is stupidest tech CEO on the planet, or one of the smartest. The event’s big takeaway is this: Apple is trying to corner a faltering computing category on the presumption it’s the next big thing. Cook takes great risk in search of greater rewards. If he’s right, Apple may come to dominate the next personal computing platform—even as Android armies spread across the planet. Everything hinges on these: Will tablets replace PCs and can Apple become the overwhelming market share leader, regaining dominance held six years ago? Lynchpin is the professional market, which Apple courts with iPad Pro, now available in two screen sizes (7.9 inches and 12.9 inches). I am using the latter as my primary computer, and the experience is as limiting as it is liberating. Some days I’m the post-PC cheerleader. On others, I gape in frustration before the capacitive touchscreen. But overall, the benefits outweigh the detriments. I will explain more in one of several follow-up posts in my adopting iPad Pro series. Back on point, Apple’s in is the creative professional who uses iPad Pro for work and also buys more for family. Sales trickle down, or up if the buyer uses iPhone. He or she can expect similar user experience, regardless of screen size, because there is a single platform (iOS). Apple controls updates, not third-party manufacturers as is the case with Android, making a more appealing and stable platform for developers and users. Consider this: iOS 9 is installed on 79 percent of active, supporting devices. By contrast, Android 6 adoption: 2.3 percent. Both operating systems are newest versions, released in September and October 2015, respectively. During this week’s event, Apple revealed that the number of available iPad apps had reached 1 million; but it’s not how many that matter but which ones are available. Utility is there, with a broad range of apps to choose from, including Microsoft Office for die-hard PC crowd. Many in that group will argue that Windows tablets provide greater utility by running a mature desktop operating system. Based on my daily iPad Pro use, I disagree. Apps matter more, and iOS has them. Windowing and fast-task switching aren’t as necessary as some people claim. That said, Apple’s platform collapses with respect to user-accessible file management, which will mater to most anyone creating or archiving documents, photos, spreadsheets, videos, and more. While iPad Pro could woe some PC upgraders, there remains the issue of ongoing trends, how Apple bucks them, and whether such strategy is forward-thinking brilliance or living-in-the-past denial. For fiscal Q1 2016, ended Dec. 26, 2015, Apple shipped 16.22 million iPads, generating $7.084 billion revenue. During the same quarter three years earlier: 22.86 million and $19.674 billion. For contrast, during this time period, iPhone shipments rose from 47.789 million to 74.779 million and revenue climbed from $30.66 billion to $51.635. Stated differently, from fiscal Q1 2013-16, iPad shipments fell by 29 percent, while iPhone’s soared by 56.5 percent. Apple isn’t the only manufacturer pinched by declines. During fourth quarter 2015, which is congruous with Apple Q1 2016, tablet shipments fell by 13.7 percent year over year, according to IDC. Perhaps, but compared to the same time period three years earlier shipments are up—25.5 percent—to 65.9 million from 52.5 million. However, Apple’s market share fell from 43.6 percent to 24.5 percent. Meanwhile, the market expanded for detachable tablets, like Microsoft Surface and iPad Pro, which was the “top-selling detachable”, according to IDC. The category, which includes a keyboard, reached an “all-time high” during the quarter. However, putting growth in context of the broader tablet market: 8.1 million detachables. “We believe Apple sold just over two million iPad Pros, while Microsoft sold around 1.6 million Surface devices, a majority of which were Surface Pro”, Jean Philippe Bouchard, IDC research director, says in a statement. “One of the biggest reasons why detachables are growing so fast is because end users are seeing those devices as PC replacements”. Bouchard says. This is the market Cook wants to reach, and the numbers justify trying. If IDC’s 2 million figure is accurate, iPad Pro accounted for 12.3 percent of Apple tablet shipments during its first full quarter of availability. The question: Who bought them? Also: If purchased to replace PCs, what didn’t purchasers buy and what does that mean for Apple? The answers segue to Apple PCs. During fiscal Q1 2013, Apple shipped 4.061 million Macs, generating $5.518 billion sales. Same quarter 2016: 5.312 million units and $6.746 billion revenue. Mac sales rose by 30.8 percent during the time periods. Based on the growth trajectory, iPad Pro didn’t much cannibalize Mac sales during the three months. What about the future? That last reward/benefit ties together Apple’s broader tablet strategy. 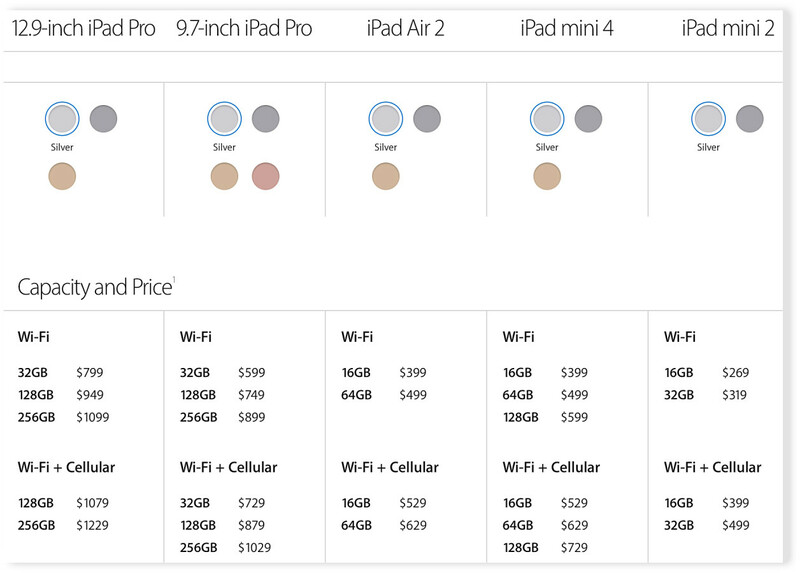 The iPad product line is bloated now and arguably overly-large. My first reaction: There’s too much complexity. I count five models and 25 configurations without accounting for color; 77 when doing so. But looking closer, I see daring (and risky) strategy at play. Cook and company looks to fill every major meaningful price band where someone might buy a tablet—but one. Starting with 16GB iPad mini 2 WiFi and ending with ending with 256GB 12.0-inch iPad Pro Cellular, prices range from $269 to $1,229. I see this continuum as Apple looking to regain market share in the broader category while expanding reach into the detachable tab category. Where the company isn’t going: sub-$200, at least not with sales of new tablets (refurbished, maybe). There are few gaps across the cost continuum and lots of overlap to tempt buyers with a better iPad rather than competing tablet. For example, iPad Air 2 now starts at $399 in a 16GB configuration, making it the most-capable Apple tablet selling for so little. The 64GB variant is $499—or same price as Google’s Pixel C with half the memory. The high-end is most interesting to me, where comparative benefits are more clearly defined and potentially could diminish cannibalization of Apple laptop sales. Consider the 12.9-inch 256GB iPad Pro WiFi. Price, $1,099, matches the 13.3-inch MacBook Air with same storage capacity. The tablet has touchscreen, and its resolution greatly surpasses the laptop. iPad price is $1,268 with keyboard cover and $1,367 when adding the Pencil. The buyer can always add the keyboard later to the tablet but not touch or resolution to the Mac. The 12-inch MacBook also packs Retina Display and weighs about the same as iPad Pro with keyboard cover. Price with 256GB storage: $1,499—or more than the iPad Pro kit with the Pencil, which offers another benefit with respect to drawing and annotations. The 13.3-inch MacBook Pro with Retina Display and 256GB storage sells for $1,499, or $132 more than the entire tablet kit. Do you want the utility of an OS X laptop or the flexibility of a modular computer—tablet, PC, drawing slate—iOS device? Perhaps you’d like built-in cellular as another benefit. That bumps the 256GB larger iPad Pro to $1,299, or $1,468 with keyboard cover (and $1,567 with Pencil). Which someone chooses doesn’t much matter to Apple as long as buyers remain customers. Cannibalization isn’t necessarily a bad thing. But consumption of another market is quite desirable, and the broader objective is wooing Windows PC users to any iPad, whether for displacement or replacement. Something else, and this cannot be over-emphasized. My comparisons focus on storage and ignore memory because RAM doesn’t much matter. Call me surprised. I am testing 12.9-inch iPad Pro, which has 4GB of memory, alongside mid-2015 MBP Retina with 3.1GHz Intel Core i7 processor and 16GB RAM. 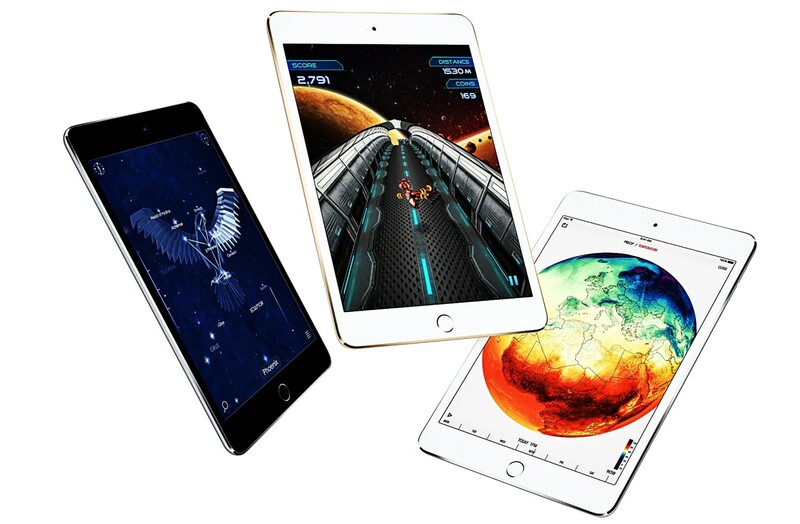 The tablet packs Apple’s A9X chip. Subjectively, I see no performance difference. Both feel plenty fast. Need I repeat that? Apple optimizes iOS for lower-power, low-memory devices, and the benefit bangs on iPad Pro. This is among the major reasons I can use the tablet as my primary PC. Limitations aren’t hardware as much as software, with iOS or apps. I can see why Apple sidelined tiny MacBook for this week’s new product fest, favoring 9.7-inch iPad Pro instead. Tim Cook bets much on his post-PC tablet strategy. Will the iPad as PC replacement, even displacement, pay off? You tell me.